Shot blasting produces similar cleaning to heavy-duty sand blasting but at a much grater production rate and without the dust, sand or messy cleanup. Surface preparation is the foundation of most flooring systems. It is the most important factor in developing a successful installation. The purpose of mechanical surface preparation is to remove contaminants which interfere with adhesion and to produce a surface roughness which enhances chemical and mechanical adhesion. There are many different surface conditions and finish requirements; our systems can accommodate the needs of many types of floor covering systems. Shot Blasting can remove most adhesives, thin set mortars, non lead paint, sealers, dirt, grease and buildup as well as general surface contaminants and concrete latency. Shotblasting leaves concrete surfaces clean, dry, and textured allowing maximum penetration and adhesion. Specially designed equipment and dust collection systems get the job done fast clean and dust free. 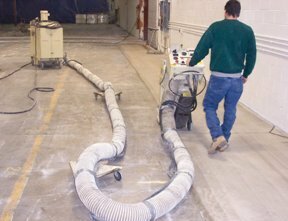 Shot blasting is the most popular and widely accepted method for preparing concrete for coatings and overlays as well as many other floor coverings. 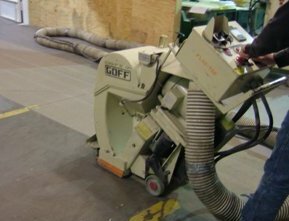 Dustless edge grinding equipment cleans the edge of a concrete slab, while the remainder of the floor is shot-blasted. A properly shot blasted surface greatly increase the effective bonding surface area for any new coating, overlay and most materials requiring surfaces adhesion to concrete. 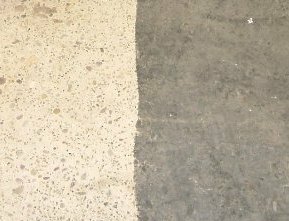 Some surfaces may require removal of existing coatings, over lays, buildup materials, high spots, concrete irregularities and curling - see Concrete Grinding and Polishing.